Jul 23 Do Not Care? The first time I ever flew on a plane I was 27. I was travelling to Pittsburgh, and it was the quickest and cheapest way to get there. Even though I had never flown before, the idea of flying did not cause much anxiety. I try to be very analytical, and so even though it was something very unfamiliar to me, I knew it was also just about the safest way to travel. So I got on the plane, stowed my baggage in the overhead, and sat down. Then came the realization: I am on this plane, and I have lost all control over the situation. There is no getting off. I am not the one flying it. This plane is either going to land, or it is going to crash, and I am powerless over which one of those is going to happen. It is times like that when you become really thankful that they don’t let just anyone fly a plane. Like me going to Pittsburgh, the disciples boarded a fishing boat one day, focused on the easiest way to get from point A to point B. A fishing boat like theirs would have had low sides, and would have been particularly susceptible to being swamped in a storm with high winds. Yet the disciples probably did not think about what might happen. As Christians, we do the same thing. We aren’t going to Pittsburgh, and we aren’t crossing the Sea of Galilee. Our desired destination is heaven, and getting in the boat with Jesus is the only way to get there. At that point, when we make that decision, we don’t often reflect on what the passage will be like. We do not ask what type of vessel we will be traveling. We do not wonder if the waters will be rough. We do not ponder the challenges we will face in life that will threaten to sink the ship in which we travel. Then comes the storm. This is the time when we begin to question whether it was wise to get in the boat to start with. The winds howl, the waves crash, and not only is the boat in danger of being swamped, but the person we followed into the boat seems to have vanished. When the storm hits the disciples’ boat as it crosses the Sea of Galilee, Jesus’s apathy is noted. Could there be anything more apathetic than sleeping? Jesus’s nonchalance begs the question from the disciples: “Teacher, do you not care that we are perishing?” The scene is all too familiar to us. We know the disciples do not ask the question out of irreverence. We know because we have asked the question ourselves, when God seemed to be absent or asleep. We asked it in those times when like the prophets of Baal, we cried out and raved to a God who did not seem to be listening. We wonder if God cares at all that we are perishing. Rembrandt. The Storm on the Sea of Galilee. 1633. Graphic retrieved from Wikimedia Commons. Public domain. In hindsight, did they see that day as a blessing or a curse? I would like to think that their experience caused them to view storms differently. There would be more storms to come, especially if they clung to their faith in Jesus. However, storms were no longer a trial that threatened to bring the end. They were trials that opened their eyes to the reality of God, and the bright future that awaited them. 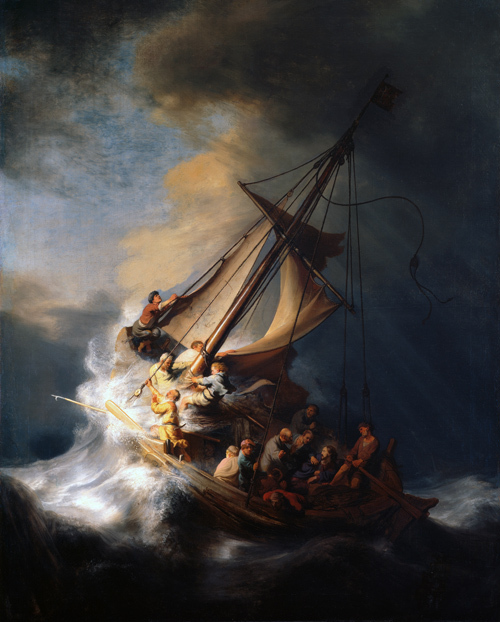 When I look at Rembrandt’s painting, my eyes cannot help but be drawn to the left, to the light. Maybe life would be better if, when in the midst of storms, my eyes stayed fixed on the light ahead, the light that Jesus has promised to bring us to if we simply trust in him. Header image: Rembrandt. The Storm on the Sea of Galilee. 1633. Graphic retrieved from Wikimedia Commons. Public domain.